Looking for something to do this Friday? There is a reception for Jerry Fogg at the Museum of Visual Materials that would definitely be worth your time. He is a regular customer of mine at Mathison’s, and I’ve worked with him for the past few years. Admission is free and there is complimentary wine and cheese while supplies last. The reception is Friday, September 12, 5:30-7:30. It will be on display from then until October 30. Receptions are great to go to because you can meet the artist and show your support for their work! Jerry Fogg is a self-taught, creative and unique artist that has a lot of passion for his craft. 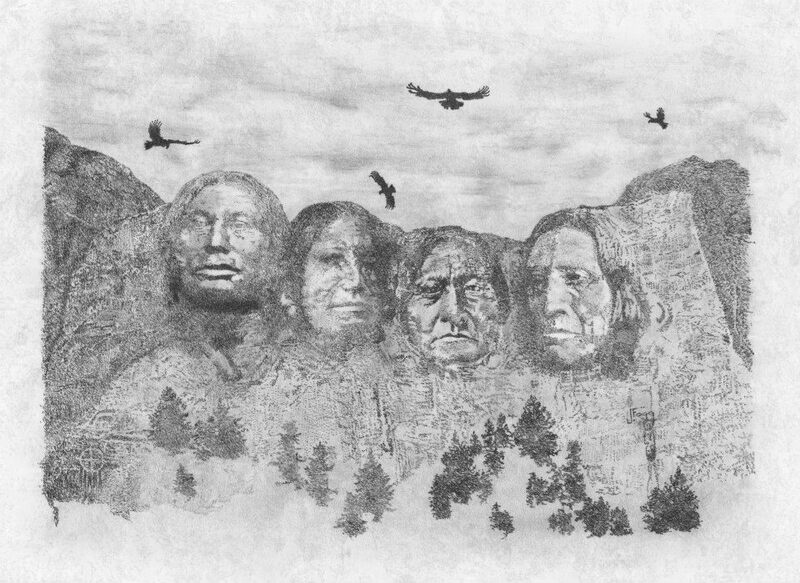 He was inspired by the works of many Native American artists. His works include highly detailed pencil drawings, paintings, and mixed media pieces. His mixed media pieces are composed of natural materials and prints to create a truly unique piece. 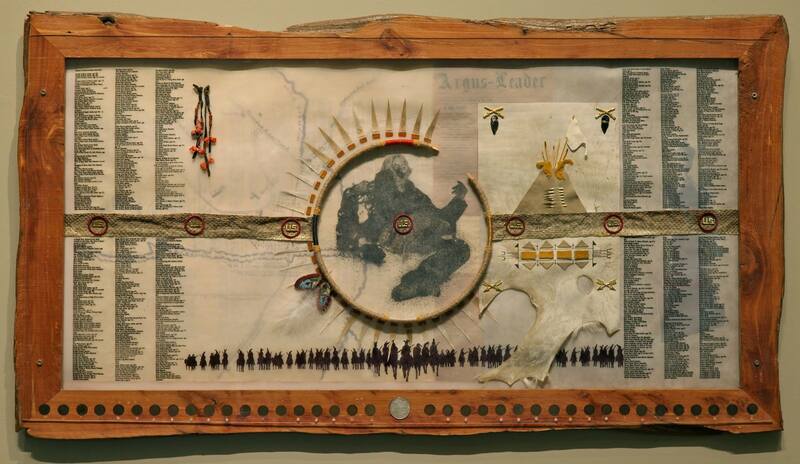 He works with materials such as leather, porcupine needles and arrow heads. If you get a chance to talk to him, he is eager to explain the different parts of his work and the meaning behind them. The pieces are an interpretation focused on a period of historical significance or a legend. He is very passionate about what he does. Plus, his pieces are one-of-a-kind and never reproduced. He has been awarded Best of Show, People’s Choice, The Mayor’s Individual Excellence Award for the Arts, and many other awards. Please make time for this talented artist! There are a few other events to add to your calendar that he mentioned to me. 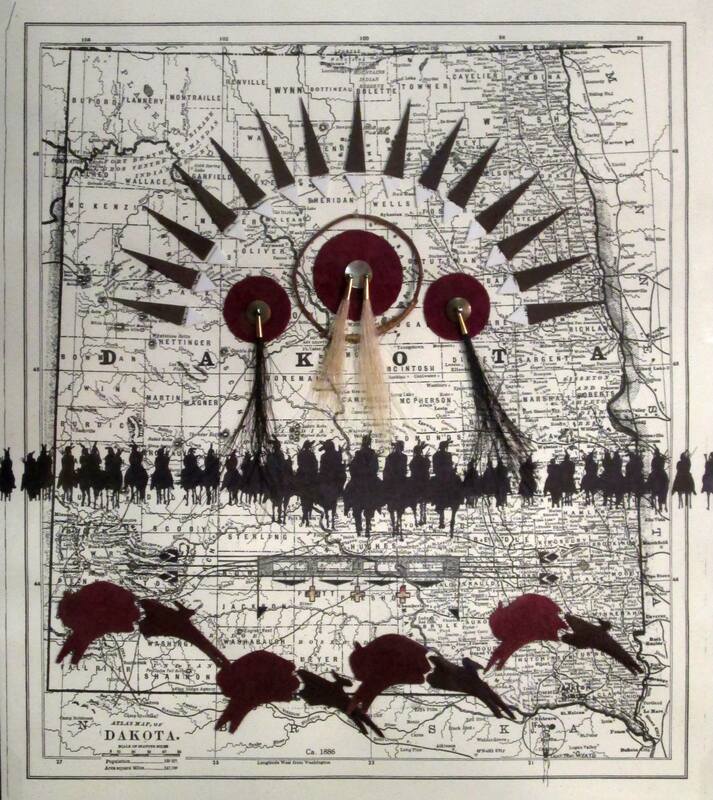 The 27th Annual “Northern Plains Indian Art Market” is September 18-21. I walked around this exhibit of various artists at the Ramkota Hotel last year, and I really enjoyed shopping around while looking at the many different booths. This year there will be a juried portion of this exhibit at the Washington Pavilion (for a $25 entry fee) on the 19th, but they will still have the paintings, sculptures, beadwork, jewelry and quillwork on display and for purchase Saturday and Sunday at the Ramkota ($5/one day, or $7/both days). There is the “Governor’s 6th Biennial Art Exhibit” that will also be at the Washington Pavilion from June 12, 2015 – October 4, 2015. This is where he has a traveling piece called [the] Hiawatha Indian Insane Asylum. This exhibit will travel all around South Dakota starting September 30, 2014 to January 20, 2016. Allyson Bousema is weekly blogger for Jam. She hopes to make people more aware of local art events in Sioux Falls. She is also a graphic designer and production manager at Mathison’s in Sioux Falls. She’s a born and raised Iowa farm girl, but has called Sioux Falls her home for the past 10 years.